Besides the Hot and Sour Soup, the West Lake Beef Soup (西湖牛肉羹) is probably the next most common soup found in Chinese restaurants in the US. Although the ingredients are simple, this is a gratifying flavorsome soup – with a rich, mellow taste and a silky smooth mouthfeel. 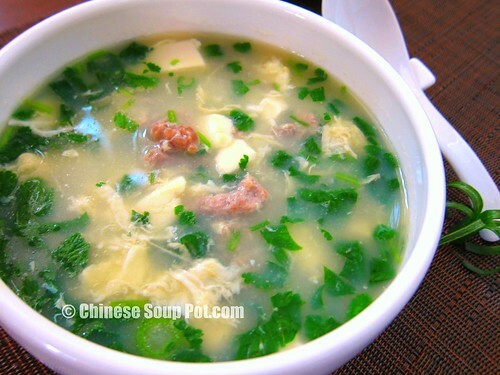 The West Lake Beef Soup is a popular local dish of the mountainous ZheJiang (浙江) Chinese province, where the famous West Lake is located. One secret to making a soft, smooth West Lake Beef Soup is the beef tenderizing step. There are several different ways to tenderize the beef. A good meat tenderizer like this one will certainly make the meat tenderizing step easy. In my recipe, I chose to use baking soda because I like the soft velvety texture it gives to the meat. This trick, along with the use of soft tofu and egg drop, gives this soup a soft silky mouthfeel. At the end, this soup turned out so well that my husband and I finished all eight servings in one afternoon. We could not bring ourselves to stop eating until the soup pot was empty! 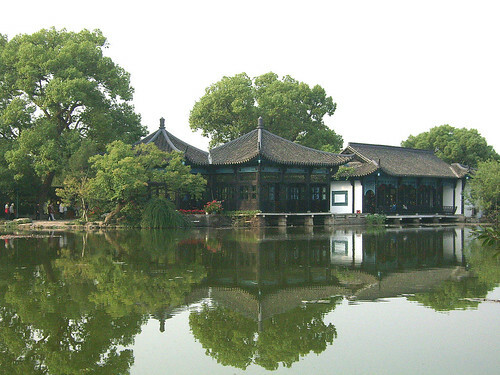 Before sharing my recipe, I want to share with you a few photos of the graceful, breath-taking West Lake. (Big thanks to the nameless photographer(s) who made these photos free for sharing.) After seeing these pictures, I understand why this lake was inscribed on the UNESCO’s World Heritage List. It is a beautiful, serene place that I hope to visit someday. Besides the West Lake Beef Soup, silk and Longjing (Dragon Well) tea are other wonders from this area that I would like to try. I’m so happy you’re posting again! I’ve often wondered how you were doing … busy I guess. This soup sounds totally wonderful! It’s getting autumn over here, so I’m craving soups more and more. Thank you very much for your comment! 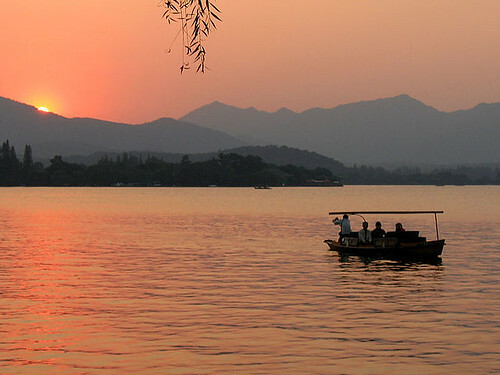 West Lake certainly seems like an astonishing place and I do hope to visit someday. Whoever was the photographer of the scenery shots, they certainly did a fantastic job! We had this the other day at a Chinese restaurant. We rarely order this one but it was such a cold day and I wanted to order something that kids would enjoy. It’s a healthy comforting soup! Is THIS what it’s called? It’s one of my favorite soups of all time, but NEVER knew what it was called! So exciting!! This soup looks so satisfying and comforting! A big bowl for me would be perfect! Your soup looks magnificent! I’ve never heard of tenderizer beef this way…what a great tip! I fondly remember this soup during my childhood but never thought it was a famous dish from a beautiful place. I love the egg drop in this soup. Hi Sharon! Love soup! would really like to try out this recipe. I was wondering would there be any substitutes for the mushroom bouillon granules if i can’t find that near where i live? Thank you very much for your visit! Thank you also for submitting a fantastic question! The mushroom bouillon granules that I use is similar to this one, but the ingredients are natural and made with real mushrooms. A substitute you can also consider is the bouillon from a brand called Better Than Bouillon which I like because it doesn’t add msg. They make a mushroom base, chicken base, and a vegetable base which can be added to soups and other dishes. For this soup, you can try adding a small amount so that you can still taste the West Lake Beef Soup without the flavor enhancer overpowering it. I hope this helps! And thank you again for your great question! I love west lake beef soup. I had this soup a handful of times when I lived in China. However I didn’t get to try the original one from west lake. Your recipe looks absolutely delicious and authentic. Thank you so much for sharing it! Great post!